When many seniors think of video games, they may imagine entertainment options for their grandchildren. However, video games are proving to be quite effective tools for senior care. 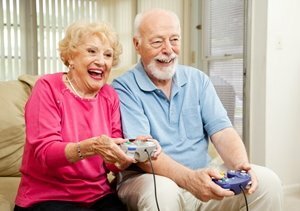 While previous studies have noted the physical and cognitive benefits of video games consoles like Nintendo Wii for older adults, a new study shows that seniors who play video games are generally happier than those who do not. The study, conducted by researchers at North Carolina State University and published online in Computers in Human Behavior, included 140 people ages 63 and older. Researchers asked the participants how often they played video games (if at all), then conducted a series of tests that gauged their emotional and social well-being. The seniors who played video games, even if they only picked up controllers from time to time, reported better emotional health than their counterparts. Those who did not play the games reported more negative feelings and tended to have higher levels of depression. Lead author Dr. Jason Allaire said he and his colleagues are planning to continue studying the link between mental health and video games. Such games are widely accessible for seniors who have mobility issues, disabilities or other conditions, so their potential to improve an older adult's well-being could be a major boon to senior care providers. The connection between video games and mental well-being may have something to do with the physical aspect of some games. The New York Times reports that so-called "exergames" can improve strength and balance in seniors, which reduces the amount of falls. Many seniors fear falling, so feeling more confident and secure may help them maintain their independence, allowing them to stay engaged and socially connected with their communities. Physical activity boosts mood in and of itself, which could also be a factor in the growing number of seniors making video games one of their favorite pastimes.